Turning your horses out in the pasture is a good way to provide them with exercise and natural forage. If your pasture is not large enough to support your herd, the University of Minnesota warns that you could suffer from overgrazing and your horses may suffer from a lack of nutrition if you do not provide additional forage for them. Having a good basic understanding of what your horse needs from his pasture will help you better decide what size you need. Oregon State University recommends having at least one acre per a horse in order to provide adequate room for activity and enough room for grazing without overburdening the land. This means that you can keep five horses in a five-acre pasture. However the true size of the pasture you need varies greatly depending on how much land you have, the quality of the land, the terrain and how many horses you want to keep on it. Even an adequately sized pasture can turn poor quality if horses are not rotated between multiple pastures. If horses are constantly in the same pasture then grass will not grow or be eaten too quickly to stay established. It is normal to give pastures times off by moving your horses between several different pastures or temporarily keeping them in paddock areas. This means that, in order to prevent overgrazing, you will need to have multiple paddocks and pastures for your horses. 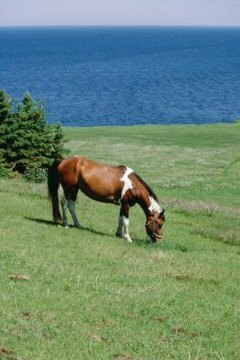 The University of Minnesota recommends removing your horses from your pastures for approximately three to four weeks each season. Allow horses to begin grazing when the grass is approximately 10 inches tall and move them onto the next pasture when the grass has been eaten to the point where it is only 3 to 4 inches tall. One of the primary reasons for the acre a horse guideline is designed to make sure a horse is able to receive adequate forage from the property. In areas where grass grows poorly, there is no grass, there is inadequate grass or there are too many horses for the amount of natural forage, hay is fed in large quantities to take the place of grass. Some small acre horse facilities do not count on their pastures to provide nutrition and instead feed large amounts of hay in order to compensate and satisfy the horse's needs. If the pasture is not needed to provide nutrition then horses can be kept in a much, much smaller enclosure since the primary purpose of turnout will be for exercise. Some barns offer little to no pasture time. These are often large facilities that house valuable competition, breeding or racing animals. These horses are given all of their nutrients in a controlled setting such as a stall or small paddock. Horses are exercised by riders, hot walkers or even on a treadmill. They spend the time they are not being worked in their stalls. The purpose of such a setting is to optimize training and appearance while minimizing the chance of injury.